Goodreads: A personal organizer must somehow convince a reclusive artist to give up her hoarding ways and let go of the stuff she’s hung on to for decades. Lucy Bloom is broke, freshly dumped by her boyfriend, and forced to sell her house to send her nineteen-year-old son to drug rehab. Although she’s lost it all, she’s determined to start over. So when she’s offered a high-paying gig helping clear the clutter from the home of reclusive and eccentric painter Marva Meier Rios, Lucy grabs it. Armed with the organizing expertise she gained while writing her book, Things Are Not People, and fueled by a burning desire to get her life back on track, Lucy rolls up her sleeves to take on the mess that fills every room of Marva’s huge home. 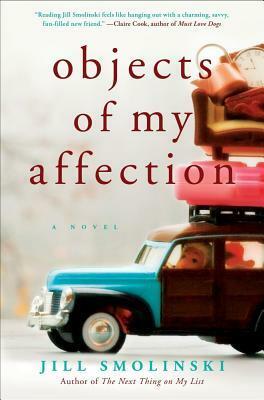 Lucy soon learns that the real challenge may be taking on Marva, who seems to love the objects in her home too much to let go of any of them. While trying to stay on course toward a strict deadline—and with an ex-boyfriend back in the picture, a new romance on the scene, and her son’s rehab not going as planned—Lucy discovers that Marva isn’t just hoarding, she is also hiding a big secret. The two form an unlikely bond, as each learns from the other that there are those things in life we keep, those we need to let go—but it’s not always easy to know the difference. Kritters Thoughts: Have you ever seen an episode of Hoarders or one of those organizational shows and wonder what really goes on behind the scenes? This book takes you in behind the scenes of a once famous artist and along with the main character, Lucy, we find out how a person can find themselves buried by their belongings. The main plot with a few sub plots were more than entertaining, enough for me to have to fight sleep to finish the book! Lucy was adorable and quirky. I loved her inability to "practice what you preach". She could help Marva remove belongings and find value in people, yet Lucy was struggling through life with blinders on to many of her own personal situations. Even with a few twists that I wish had gone a different way, the writing was simple and sweet which I always find to be enjoyable. A book that I would pass onto a variety of readers, although a chick lit, skeptics to the genre would adore this sweet story about a woman finding value in herself. April-June Challenge 2012: Happy Birthday!